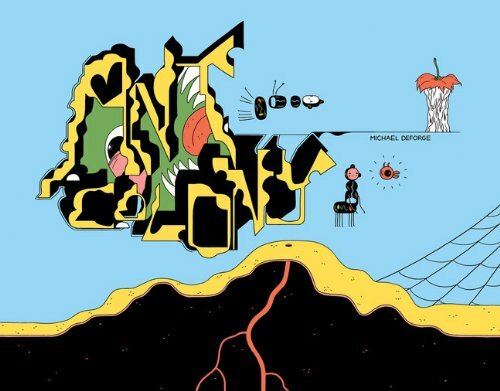 Ant Colony, a full color hardcover book published by Drawn & Quarterly, is the latest collection of comics by Michael DeForge. It collects DeForge’s long running web-comic of the same name. I was lucky enough to meet the cartoonist last night at Skylight Books in Los Angeles, and got to see his slide show presentation which was all about his creative process, and all of the work he’s abandoned over the years. I have to say that it was an impressive amount of material to leave on the cutting room floor. There was one comic of his called Open Country that he stopped after two issues, because he didn’t like it anymore. He said that he destroyed the original artwork, and remaining printed copies of that. 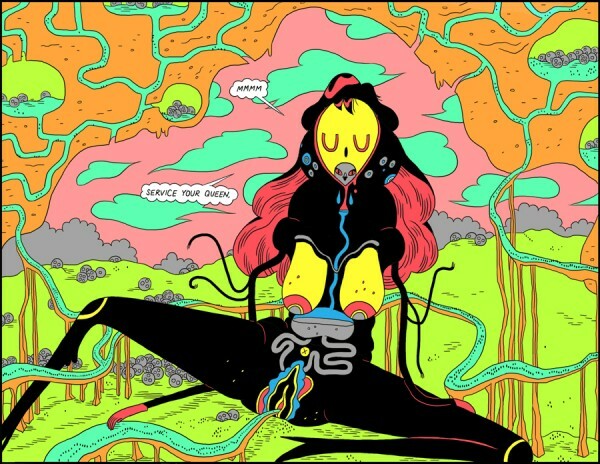 Lose #1 was another victim of DeForge’s ever shifting self evaluation, so you won’t be seeing that material when the first Lose collection premieres at TCAF this year. I admire his ability to “bury” work that doesn’t feel right, and move on to something else. 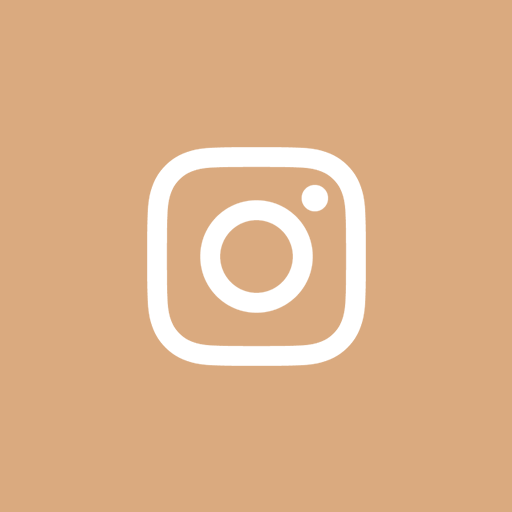 Many artists would have a difficult time ditching something midstream when they’ve invested so much time in it, even if it’s clearly not working. He also said that he stopped scripting out stories really far ahead. He found that he could make more interesting work that he was emotionally invested in by planning/writing it the same day that he draws it. 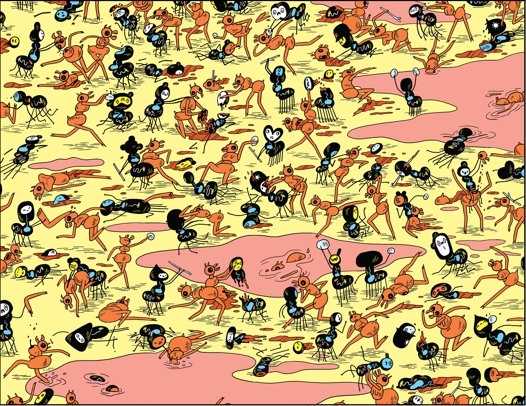 I’m about halfway through Ant Colony, and it’s great, but for many of us who have already read many of the strips online, that is no surprise. It’s “the book” to give as a gift to a friend or family member, or stranger on the street, if you’d like to introduce them to DeForge’s work. It’s colors are eye-popping, and it’s strange, humorous saga will warm even the coldest of hearts! This is another good “acid trip comic”, but there’s so much more going on with these ants…something very deeply human and…maybe I’ll figure out what I’m saying once I finish reading it. 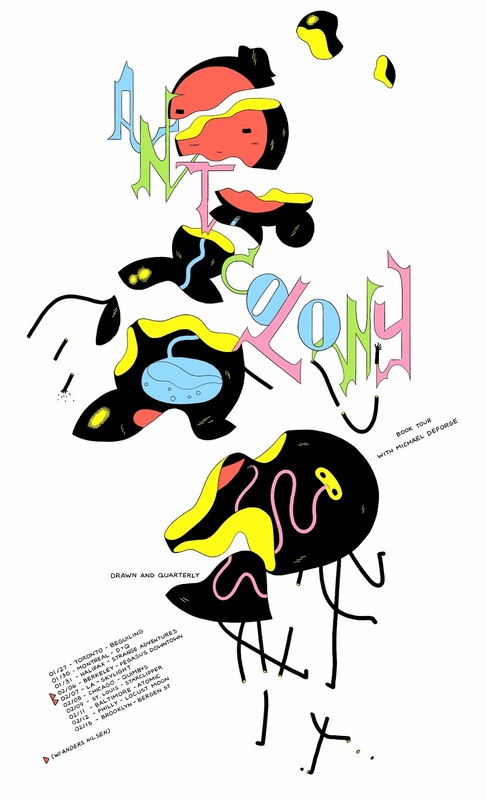 So, go buy Ant Colony for yourself, or cancel that Valentine’s Day order, and give your honey some DeForge action this year!